There’s no better way to build community engagement than to actually listen to communities, and hear from them on how to make their neighborhood safer. This summer, we launched the Collaborative Public Safety Strategies program. It’s a first-of-its kind effort in the US that set aside $500,000 for collaborative, community driven public safety strategies in Little Earth and the surrounding area, and the West Broadway corridor in north Minneapolis. These strategies are designed and implemented by the communities themselves. 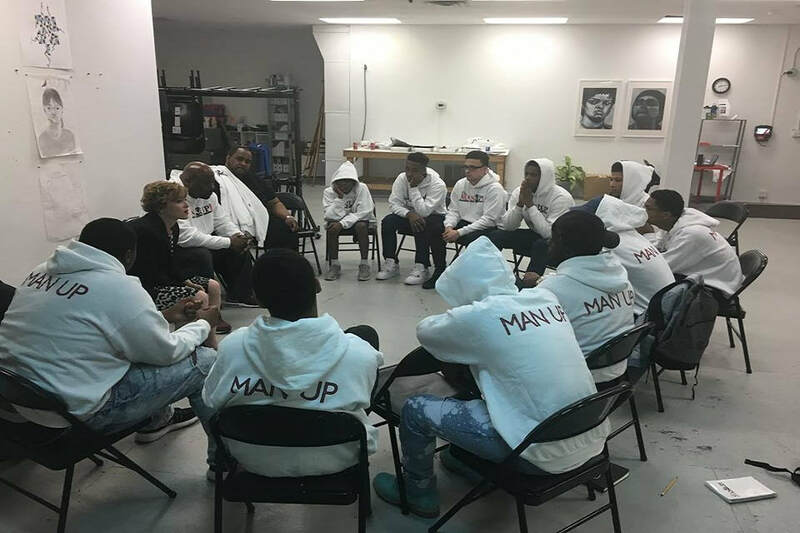 The Man Up Club received an award through this program – they’re a youth leadership organization serving African American young men and boys, and they used these additional funds to support programming for 15 young men. I had the chance to meet with them during the Cities United convening, and last night I headed over to Juxtaposition Arts to sit with them again and listen to their stories. 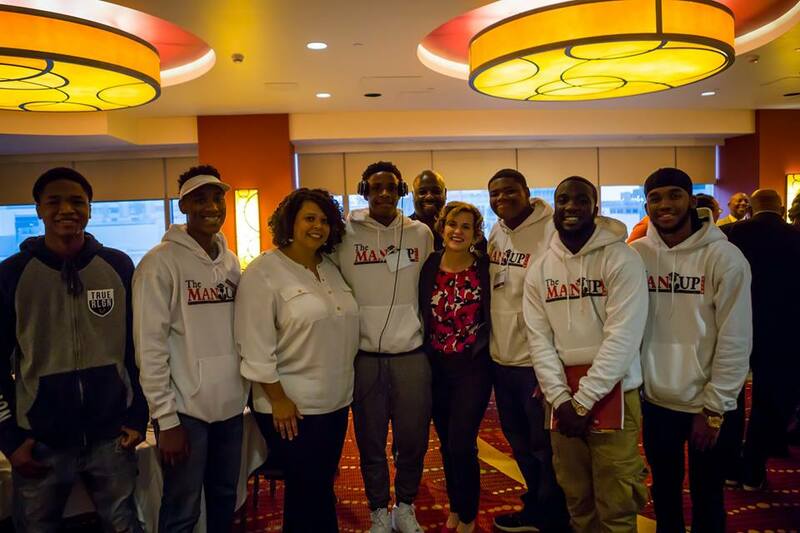 It’s so clear that even amid some real pain, loss and trauma, the Man Up Club is giving these young men hope. And I know firsthand how important hope is in a young life. Thanks so much to Korey Dean for his important work, his leadership, and for inviting me to share their space for an evening. Listen to Man Up Club on MPR News here! Our Man up Club summer program serves African American males age 16 to 24. The Man Up Club in collaboration with Sammy’s Avenue Eatery and US Bank engages youth in crisis in the West Broadway corridor by providing mentoring sessions with professional adult role models interacting one-on-one to create an atmosphere that encourages young men to recognize the significance of social responsibility, civic pride, and exhibit responsible behavior as they meet life‘s challenges to narrow the opportunity gap. Our summer program participants receive a sit down dinner table nutritional meal during each weekly session at Sammy’s Avenue Eatery. Each participant earns an incentive stipend bi-weekly and participants in life skills workshops in the area of financial management and budgeting in order to encourage civic responsibility and to help understand the economics of life. Our summer program serve up to 15 young black men who are fatherless, or without positive adult role models in their lives. The program runs from July 6th to July 13th to promote safety and community engagement. We host outreach activities that allow participants to develop positive self-esteem and understand what it means to plan for success, build core values, and develop realistic goals and behavior that will allow them to realize their full potential. In addition participants go on 3 field trips outside of North Minneapolis. The purpose is to connect youth with positive adult mentors, who share similar interests, understand life challenges, and how to achieve academically and professionally. Through this connection, and 10 guest speakers, youth will develop knowledge about what it takes to realize their full potential and avoid common obstacles that limit opportunities.